Seymours Estate Agents – the largest independent estate agent in Surrey - is delighted to announce that local charity, Cherry Trees, has won the company’s online ‘Keepy Uppy Challenge’. To coincide with Euro 2016, award-winning estate agency Seymours launched a social media campaign, which encouraged people to post a video of themselves on the company’s Facebook page doing ‘keepy uppies’ with a football or random object of their choice. Participants then nominated their favourite charity and invited three friends to also take on the fundraising challenge, with the promise of a £2,000 prize for the charity named in the video with the most likes. Despite England’s early departure from the Euros, the Keepy Uppy Challenge saw a vast amount of entries, even extending as far as Uganda. However, it was a video which nominated local charity, Cherry Trees, that garnered the most attention, clocking up a massive 320 Facebook likes. The video saw head coach of the Invictus Games GB cycling team, Andrew Pink, successfully complete 185 keepy uppies, while holding a conversation about his coaching at the games and his work with Cherry Trees. Andrew, who was crowned Young Coach of the Year at the 2015 UK Coaching Awards, created such an entertaining entry that the video was watched more than 3,000 times. Cherry Trees provides short breaks and respite care for young people aged 0-19 with a range of disabilities including learning, physical and sensory impairments and is based in East Clandon, Surrey. Seymours was overwhelmed by the success of the social media campaign, which ran for eight weeks from May 2016. 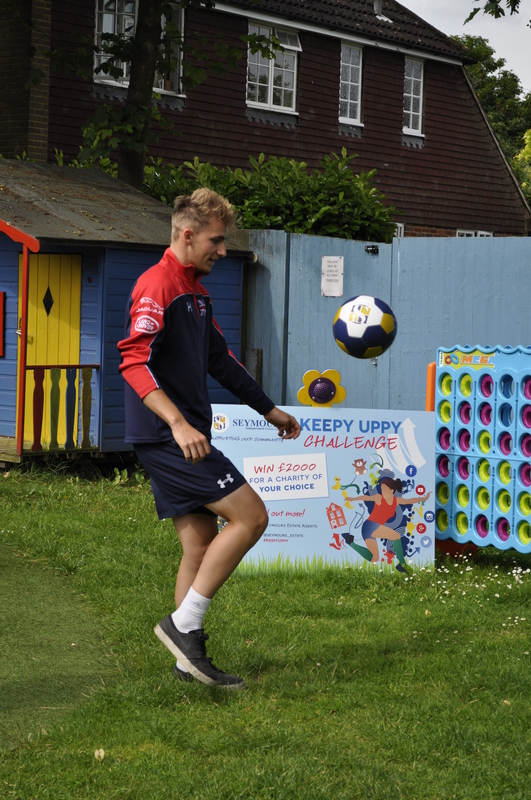 John Ferrucci, Director of Seymours Woking, comments: “We have been pleasantly surprised with the amount of people who have taken the time to take part in the Keepy Uppy challenge in order to raise money for charities close to their hearts, both locally and further afield. All of the Keepy Uppy Challenge videos are still available to view on the Seymours’ Facebook page.